Is color information sent from the eye to the brain frequency-modulated, or are different colors transmitted by different axons? I know that each ganglion cell is connected to multiple photoreceptors. 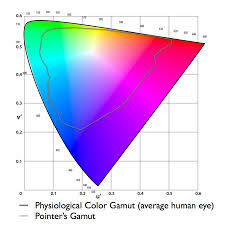 How do ganglion cells tell the brain which photoreceptors were exactly activated and by what color? Do ganglion cells correspond to particular colors? Can one ganglion cell transmit different signals to the brain? How does the brain know which color the light has, if signals of different receptors are mixed in the ganglion? Color vision is mediated by spike rate modulation (frequency modulation if you like), as well as ganglion-cell specific stimulation. Ganglion cells exist that transmit opponent colors. 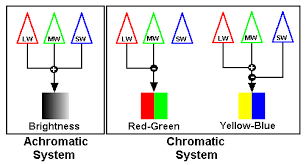 The color opponency model predicts that we cannot perceive a greenish-red or yellowish blue, which is quite right. We can, however, see mixtures of the two channels, such as red and yellow (orange), and red and blue (purple). Indeed, it has been shown that these ganglion cells exist, i.e. cells that increase their firing in response to short-wavelength-sensitive (S+) and decrease their firing to middle-wavelength-sensitive (M-) and vice versa (Yin et al., 2009). Hence, it is not so that the frequency of light is represented in firing rate per se, but the frequencies of light are translated in spike rates, because spike rate is the only means in which neurons can transmit graded responses. In other words, every type of graded information is translated into spike rate eventually, including pressure differences, acoustic loudness etc. Hence, as ganglion cells are sensitive to opponent pairs of colors, they do respond to particular colors. However, a "purple ganglion cell" does not exist, it is the combination of red and blue activations that lets us see colors due to synthetic processes in higher neural centers. One ganglion cell can send different signals to the brain as it is basically an analogue converter of the red/green and yellow/blue opponent colors. - Advantage of opponent color? Not the answer you're looking for? Browse other questions tagged human-biology neuroscience vision neurophysiology or ask your own question. What gives things their colour? How do our eyes detect light at different frequencies?